Voltaire addressed the following letter to the Journal encyclopédique, dating it 1 April 1759. (This may have been a poisson d'avril, an April Fool's joke!) It was not printed in the Journal encyclopédique until 15 July 1759. In any case, the letter reveals Voltaire's love for disguises and literary games, as well as the controversial nature of Candide. In this letter he disguises himself as the brother of the supposed author of the tale, Captain Demad. (It should be remembered that Voltaire also knew English well enough to make puns of this sort rather frequently.) 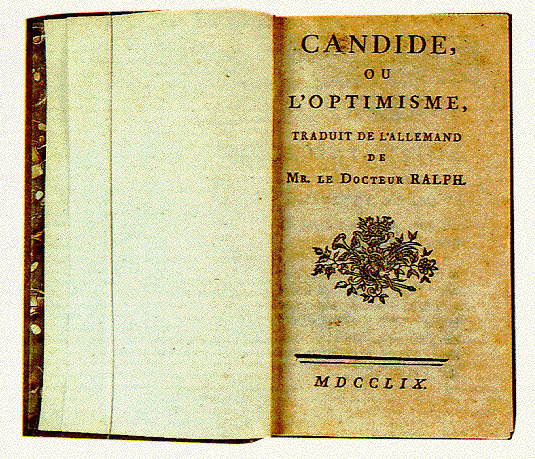 By adopting this persona, he further displaces authorial responsibility for Candide, which in the original edition had been attributed to the "Docteur Ralph" (see the post-script at the end of the letter and an image of the title page of the first edition). This game of disguises also reminds us that Candide was subject to censorship and that Voltaire did not openly claim it as his own work. Despite these precautions and strategies of misdirection, Voltaire uses this letter to reaffirm some of the critiques from his tale, notably his denunciation of the Jesuit dominance of Paraguay (chapters 14 and 15) and his ridicule of the doctrine of "all is well." The Journal encyclopédique was a fairly high-profile periodical at the time. It was largely supportive of the philosophes and of Voltaire in particular. But it had given a negative assessment of Candide. The English translation of this letter is taken from the Norton Critical edition of Candide, Voltaire, Candide or Optimism, a new Translation, Backgrounds, Criticism, translated and edited by Robert M. Adams (New York: W. W. Norton & Company "A Norton Critical Edition," 1966), p. 175-6. You say, in the March issue of your journal,* that some sort of little novel called Optimism or Candide is attributed to a man known as Monsieur de V . . . I do not know what Monsieur V . . . you mean; but I can tell you that this book was written by my brother, Monsieur Demad, presently a Captain in the Brunswick regiment; and in the matter of the pretended kingdom of the Jesuits in Paraguay, which you call a wretched fable, I tell you in the face of all Europe that nothing is more certain. I served on one of the Spanish vessels sent to Buenos Aires in 1756 to restore reason to the nearby settlement of Saint Sacrement; I spent three months at Assumption; the Jesuits have to my knowledge twenty-nine provinces, which they call "Reductions," and they are absolute masters there, by virtue of eight crowns a head for each father of a family, which they pay to the Governor of Buenos Aires--and yet they only pay for a third of their districts. They will not allow any Spaniard to remain more than three days in their Reductions. They have never wanted their subjects to learn Spanish. They alone teach the Paraguayans the use of firearms; they alone lead them in the field. The Jesuit Thomas Verle, a native of Bavaria, was killed in the attack on the village of Saint Sacrement while mounting to the attack at the head of his Paraguayans in 1737--and not at all in 1735 as the Jesuit Charlevoix has reported; this author is as insipid as he is ignorant. Everyone knows how they waged war on Don Antequera, and defied the orders of the Council in Madrid. They are so powerful that in 1743 they obtained from Philip the Fifth a confirmation of their authority which no one has been able to shake. I know very well, gentlemen, that they have no such title as King, and therefore you may say it is a wretched fable to talk of the Kingdom of Paraguay. But even though the Dey of Algiers is not a King, he is none the less master of that country. I should not advise my brother the Captain to travel to Paraguay without being sure that he is stronger than the local authorities. For the rest, gentlemen, I have the honor to inform you that my brother the Captain, who is the best-loved man in his regiment, is an excellent Christian; he amused himself by composing the novel Candidein his winter quarters, having chiefly in mind to convert the Socinians. These heretics are not satisfied with openly denying God necessarily made our world the best of all possible ones, and that everything is well. This idea is manifestly contrary to the doctrine of original sin. These innovators forget that the serpent, who was the subtlest beast of the field, tempted the woman created from Adam's rib; that Adam ate the forbidden fruit; that God cursed the land He had formerly blessed: Cursed is the ground for thy sake: in the sweat of thy face shalt thou eat bread. Can they be ignorant that all the church fathers without a single exception found the Christian religion on this curse pronounced by God himself, the effects of which we feel every day? The Socinians pretend to exalt providence, and they do not see that we are guilty, tormented beings, who must confess our faults and accept our punishment. Let these heretics take care not to show themselves near my brother the Captain; he'll let them know if everything is well. P.S. My brother the Captain is the intimate friend of Mr. Ralph, well-known Professor in the Academy of Frankfort-on-Oder, who was of great help to him in writing this profound work of philosophy, and my brother was so modest as actually to call it a mere translation from an original by Mr. Ralph. Such modesty is rare among authors. *N.B. [Note by the Journal encyclopédique] This letter was lost in the post for a long time; as soon as it reached us, we began trying--unsuccessfully--to discover the existence of Monsieur Demad, Captain of the Brunswick Regiment.